As Frank Burns once said, “It’s nice to be nice… to the nice.” Though Frank was wrong about a lot of things, he was actually right on on that statement. And that (admittedly clumsy) quote is perhaps best exemplified by Yotsuba&! by Kiyohiko Azuma. Azuma’s manga is a quiet, slice-of-life affair about a Japanese translator raising his adopted five-year-old daughter as a single father. But he’s not alone — he’s supported by a wide-ranging cast of friends. If you’re looking for a little bit of light joy in your life, Yotsuba&! is the answer. Azuma is best known for Azumanga Daioh, a manga about a group of high schoolers that was adapted into a popular anime series. Though I’ve heard of Daioh, I’m unfamiliar with it, though it appears to be another light slice-of-life comedy. Though that manga ended in 2002, Azuma’s been creating Yotsuba&! since Azumanga Daioh ended. Yotsuba&! follows the title character, an utterly adorable little girl who, well, to paraphrase the series’ tagline, enjoys everything. Yotsuba acts like a real 5-year-old, but a particularly kind and caring one — but don’t cross her! (She might turn your shoes upside down.) She’s still working out the world around her, but luckily she’s got lots of help. Her dad, Yousuke Koiwai, works at home as a translator, so he’s always available whenever Yotsuba needs him, and he’s a great, caring, engaging father. They live next door to the Ayase family, who welcomed Yotsuba (and Yousuke!) into their lives almost immediately. If she’s not at home, Yotsuba is probably over there, playing with the three Ayase daughters, Asagi, Fuuka and Ena. There are lots of other characters — like Yousuke’s friends Yanda and Jumbo, local merchants like “Udon Grandpa,” who works in a restaurant and “Shaggy Beard,” who works at the bike shop. They all have one thing in common: They’re the best. 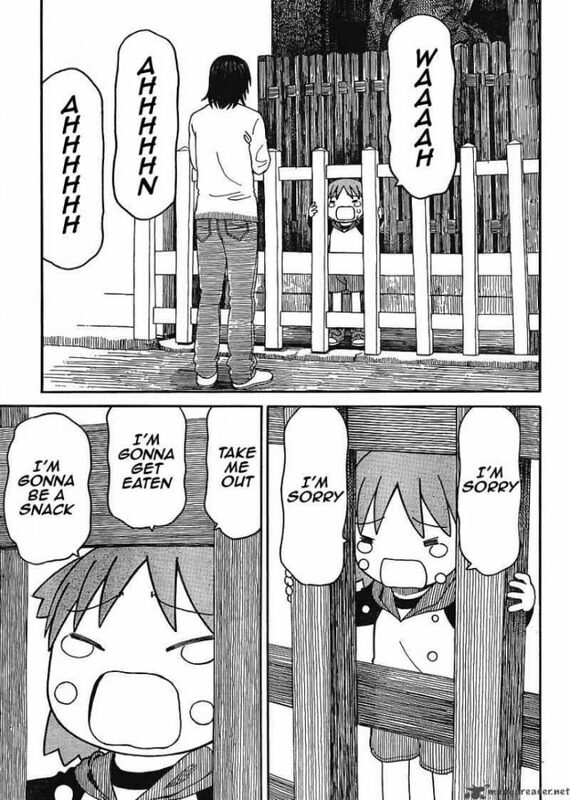 There’s not a lot of plot in Yotsuba&! — things always work out. The stakes are low, at least, when there even are stakes. While this might make feel Yotsuba&! feel slight, the warm nature and expressive art by Azuma gives the story heft. There are currently 14 volumes available, and thankfully the series is still going. It often feels like we only get manga in the United States after it’s wrapped up, so the fact that there are more Yotsuba adventures to be collected is a true treat. 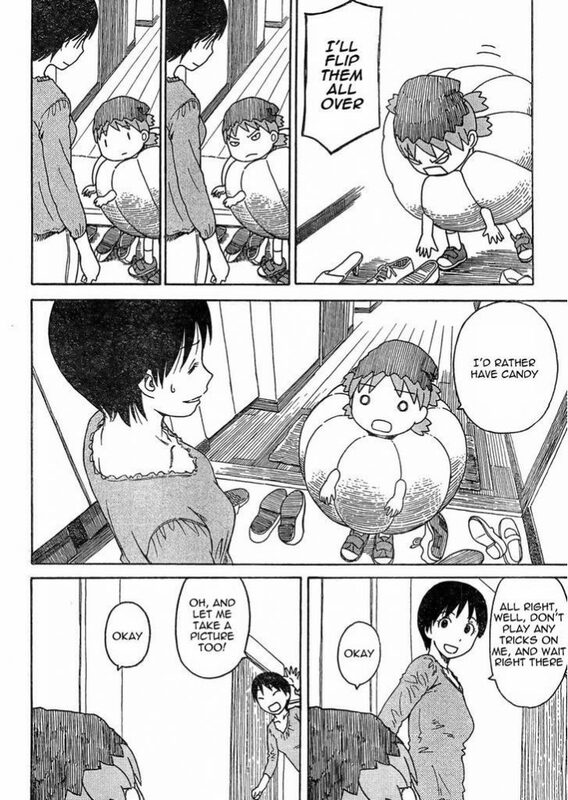 Admittedly, the fact that very little happens in Yotsuba&! makes it a little difficult to write about. I first discovered Yotsuba&! as a meme of all things. On Tumblr, there were lots of image macros and, better yet, snippets of stories. I didn’t know what I was looking at, but I knew I wanted to see more of this adorable little girl and her adventures. A reverse image lookup revealed the source — and there you go. Finally — though Azuma has said Yotsuba&! will never get its own anime, separating it from Daioh, there is a spinoff anime. Nyanbo! is about cat versions of the cardboard robot Danbo that appears in a few Yotsuba&! comics. I haven’t checked it out yet, but I know what I’m watching next.